How Far Will Social Drive Mobile Ad Spend? How many minutes have you spent on your phone today? Perhaps you’ve checked your email, clicked through your go-to social messaging applications and scrolled through your news feed. The different sessions quickly add up when you’re constantly checking in during the day, so it’s no wonder that the average U.S. adult spends roughly four to five hours daily on their mobile devices. The growing use of smartphones—thanks to innovations like increased screen sizes, more intuitive mobile user interfaces and more app choices than we could ever need—has revolutionized how, and how often, we are connected. In addition, we are spending more time on social apps and demand to be part of the conversation while we’re on the go. This mounting usage has led to more monthly active users and more in-app hours logged than ever before. In response, brands are upping their ad spend on mobile to reach these consumers where they are most. In fact, mobile ad spend recently outpaced desktop ad spend, mainly because of the increasing time spent on social. And while Mary Meeker pointed out that time spent on mobile is growing at a faster rate than mobile ad spend (in what she refers to as a $16 billion opportunity), I predict that we will see mobile ad spend continue to climb and savvy marketers start to close that gap. When it comes to preferred mobile ad formats, native advertising is favored on social platforms. Native ads mimic the look and feel of the existing content on the app or mobile webpage. They are also known to be less intrusive to consumers and have higher engagement than other display ad formats on mobile. With many of us spending several hours each day viewing shared content through our social feeds, native ads seamlessly blend into the conversation. So, what could the future of mobile and social look like in the U.S.? If there’s any market that shows us its potential, it’s China—largely due to the success of WeChat. WeChat is a social messaging video app owned by Tencent. It currently has more than 900 million active users, and its high levels of daily usage accounts for why the country clocks in roughly 3 billion hours within mobile apps each month. WeChat offers different utilities for its users, whether it’s posting photos, sending and receiving money or mobile shopping. It also provides various interactive ad formats for brands to engage with their target audiences, including native advertising. WeChat’s incredible adoption is why Tencent is expected to see $6 billion in revenue this year from mobile ad spend alone. KakaoTalk is a South Korean messaging app that boasts over 95 percent active engagement from the country’s smartphone users. What WeChat and Kakao have in common is their evolution from purely messaging services to mobile lifestyle platforms. While KakaoTalk is by far its most widely used app, parent company Kakao has developed more than 20 apps that provide various social and on-demand services, including KakaoStory, KakaoBank and KakaoTaxi (and more are being created as we speak). 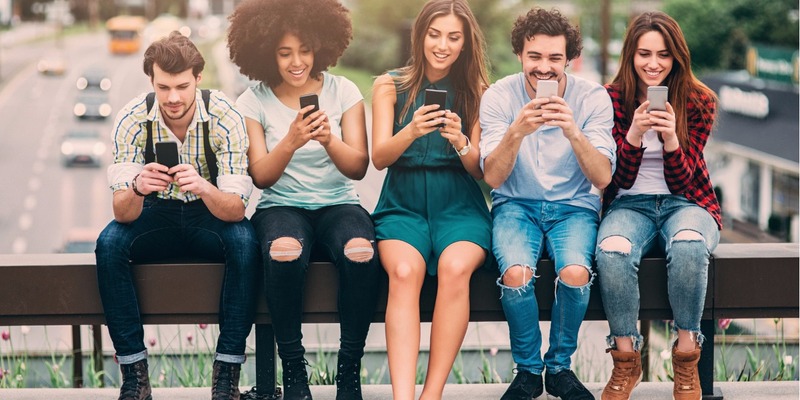 We are only starting to scratch the surface of mobile’s potential in the U.S., and as marketers, we’d be foolish to ignore this massive opportunity. Due to WeChat’s and Kakao’s success, it’s likely that we will also see more in-demand services being offered through social apps as companies pivot toward this mobile lifestyle platform model, which means more ways for brands to connect with individuals. However, it’s important to remember that a strong digital advertising strategy that encompasses both mobile and desktop is key to cut through the noise and reach your audience wherever they are. Today, mobile has proven to be effective at generating more brand awareness than desktop, yet desktop still draws higher purchase conversion rates. In time, this trend will also shift, which is why it’s important to work with a trusted advertising partner that will not only work with you to develop an integrated strategy that connects your brand with customers across all touchpoints, but will also help you adapt as the market evolves. JB Brokaw is North American president of programmatic advertising solutions provider Sociomantic Labs.